Dwayne Michael Carter, Jr. (born September 27, 1982), better known by his stage name Lil Wayne, is an American rapper. At the age of nine, Lil Wayne joined Cash Money Records as the youngest member of the label, and half of the duo, The B.G. 'z, with B.G.. In 1997, Lil Wayne joined the group Hot Boys, which also included rappers Juvenile, B.G., and Young Turk. Hot Boys debuted with Get It How U Live! that year. Lil Wayne gained most of his success with the group's major selling album Guerrilla Warfare, released in 1999. Also in 1999, Lil Wayne released his Platinum debut album Tha Block Is Hot, selling over one million copies in the U.S. Although his next two albums Lights Out (2000) and 500 Degreez (2002) were not as successful (only reaching Gold status), Lil Wayne reached higher popularity in 2004 with Tha Carter, which included the single "Go D.J." Wayne also appeared on the Destiny's Child top ten single "Soldier" that year. In 2005, the sequel to Tha Carter, Tha Carter II, was released. In 2006 and 2007, Lil Wayne released several mixtapes and appeared on several popular rap and R&B singles. His most successful album, Tha Carter III, was released in 2008 and sold over 1 million copies in the U.S. its first week of release. It included the number-one single "Lollipop" featuring Static Major. It also includes the singles "A Milli" and "Got Money" featuring T-Pain and won the Grammy Award for Best Rap Album. Lil Wayne released his debut rock album, Rebirth, in 2010 to primarily negative reception from critics. The album eventually went gold. In March 2010, Lil Wayne began serving an 8-month prison sentence in New York after being convicted of criminal possession of a weapon stemming from an incident in July 2007. While in prison he released another album entitled I Am Not a Human Being in September 2010, featuring Young Money artists such as Drake, Nicki Minaj and Lil Twist. His ninth studio album and first since being released from prison, Tha Carter IV, was released on August 29, 2011. The album includes the songs "6 Foot 7 Foot" featuring Cory Gunz, "How to Love" and "She Will" featuring Drake. It sold 964,000 copies in the U.S. its first week out. In 1997, Carter joined the Hot Boys along with rappers Juvenile, B.G., and Turk. At age 15, Carter was the youngest member at that time. Hot Boys' debut album Get It How U Live! was released the same year, followed in 1999 by the group's major-label debut Guerrilla Warfare, which reached No. 1 on the Billboard magazine Top R&B/Hip-Hop Albums chart and No. 5 on the Billboard 200. During their career, the Hot Boys had two charting singles, "We on Fire" from Get It How U Live! and "I Need a Hot Girl" from Guerrilla Warfare. Carter was also featured on Juvenile's single "Back That Azz Up", which reached No. 18 on the Billboard Hot 100 and No. 5 on the Hot R&B/Hip-Hop Singles & Tracks. Let 'Em Burn, a compilation album of unreleased tracks recorded during 1999 and 2000, came out in 2003, several years after the group disbanded. It reached No. 3 on the Top R&B/Hip-Hop Albums chart and No. 14 on the Billboard 200. Carter's debut solo album Tha Block Is Hot at age 17 featured significant contributions from the Hot Boys and was certified platinum, debuting at No. 3 on the Billboard album charts. The album earned him a 1999 Source magazine award nomination for "Best New Artist", and also became a Top Ten hit. The lead single was "Tha Block Is Hot". After the release of Tha Block is Hot, Carter was featured on the single, "Bling Bling", with B.G., Juvenile, and Big Tymers. His verse was featured on the radio edition, and on the album version, only his hook was featured on the single. His 2000 follow-up album Lights Out failed to attain the level of success achieved by his debut but was certified gold by RIAA. Critics pointed to the lack of coherent narratives in his verses as evidence that he had yet to mature to the level of his fellow Hot Boys. The lead single was "Get Off The Corner" which was noticed for an improvement in lyrical content and style, it also received a music video. The second single which received less attention was "Shine" featuring The Hot Boys. Near the release of Lights Out, Lil Wayne was featured on the single, "1# Stunna" with Big Tymers and Juvenile, which rose to 24th place on the Hot Rap Tracks charts. Lil Wayne's third album 500 Degreez, released in 2002, followed the format of his previous two, with significant contributions from the Hot Boys and Mannie Fresh. While certified Gold like its predecessor, it too failed to match the success of his debut. The title was a reference to the recently estranged Hot Boys member Juvenile's recording, 400 Degreez. The lead single was "Way Of Life" which like the album failed to match the success of his previous singles. After the release of 500 Degreez, he was featured in the single "Neva Get Enuf" by 3LW. In the summer of 2004, Wayne's album Tha Carter was released, marking what critics considered advancement in his rapping style and lyrical themes. In addition, the album's cover art featured the debut of Wayne's now-signature dreadlocks. 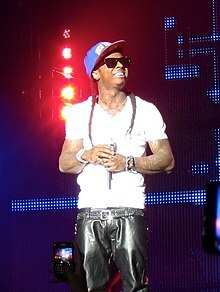 Tha Carter gained Wayne significant recognition, selling 878,000 copies in the United States, while the single "Go DJ" became a Top 5 Hit on the R&B/Hip-Hop chart. After the release of Tha Carter, Lil Wayne was featured in Destiny's Child's single "Soldier" with T.I., which peaked at No. 3 on the U.S. Hot 100 and the U.S. R&B Charts. Tha Carter II, the follow-up to the original Tha Carter album, was released in December 2005, this time without production by longtime Cash Money Records producer Mannie Fresh, who had since left the label. Tha Carter II sold more than 238,000 copies in its first week of release, debuting at No. 2 on the Billboard 200 albums chart, and went on to sell 2,000,000 copies world wide. The lead single, "Fireman," became a hit in the US, peaking at 32 on the Billboard Hot 100 chart. Other singles included "Grown Man", "Hustler Muzik", and "Shooter" (featuring R&B singer Robin Thicke). 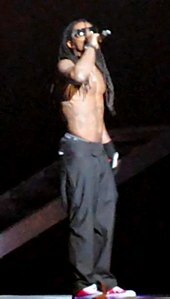 Lil Wayne also appeared on a remix of Bobby Valentino's "Tell Me", which rose to No. 13 on the U.S. R&B Charts. In 2005, Lil Wayne was named president of Cash Money, and in the same year he founded Young Money Entertainment as an imprint of Cash Money. However, as of late 2007, Lil Wayne reported that he has stepped down from the management of both labels and has handed management of Young Money over to Cortez Bryant. Instead of a follow-up solo album, Lil Wayne reached his audience through a plethora of mixtapes and guest appearances on a variety of pop and hip-hop singles. Of his many mixtapes, Dedication 2 and Da Drought 3 received the most media exposure and critical review. Dedication 2, released in 2006, paired Lil Wayne with DJ Drama and contained the acclaimed socially conscious track "Georgia Bush," in which Lil Wayne critiqued former US president George W. Bush's response to the effects of Hurricane Katrina on the city of New Orleans. Da Drought 3 was released the following year and was available for free legal download. It contained Lil Wayne rapping over a variety of beats from recent hits by other musicians. Numerous of features in prominent hip-hop magazines such as XXL and Vibe covered the mixtape. Christian Hoard of Rolling Stone magazine considered the mixtapes Da Drought 3 and The Drought Is Over 2 "among the best albums of 2007." Initially planned to be released in 2007, Tha Carter III's largest delay came after the majority of the tracks were leaked and distributed on mixtapes, such as "The Drought Is Over Pt. 2" and "The Drought Is Over Pt. 4". Lil Wayne initially decided to use the leaked tracks, plus four new tracks, to make a separate album, titled The Leak. The Leak was to be released December 18, 2007, with the actual album being delayed until March 18, 2008, The release of The Leak in this format never came to fruition, but an official EP titled The Leak and containing five tracks was released digitally on December 25, 2007. Tha Carter III was released on June 10, 2008, selling more than a million copies in its first week of release, the first to do so since 50 Cent's The Massacre in 2005. The first single "Lollipop", featuring Static Major became the rapper's most commercially successful song at that point, topping the Billboard Hot 100, making it the first Top 10 single for Lil Wayne as a solo artist, as well as his first No. 1 on the chart. His third single from Tha Carter III, "Got Money" featuring T-Pain, peaked at No. 13 on the Billboard 100. Tha Carter III also won four Grammy Awards, including best rap album and best rap song, which he won for "Lollipop". Along with his album singles, Lil Wayne appeared on R&B singles "Girls Around the World" by Lloyd, "Love In This Club, Part II" by Usher, "Official Girl" by Cassie, "I'm So Paid" by Akon, "Turnin' Me On" by Keri Hilson, and "Can't Believe It" by T-Pain; rap singles "My Life" by The Game, "Shawty Say" by David Banner, "Swagga Like Us" by T.I., "Cutty Buddy" by Mike Jones, All My Life (In the Ghetto) by Jay Rock and the remix to "Certified" by Glasses Malone; and pop single "Let It Rock" by new Cash Money artist Kevin Rudolf. On July 14, 2008, the Recording Industry Association of America certified Tha Carter III two times platinum. In an October 2008 interview with MTV News, Lil Wayne announced plans to re-release this album with all new tracks, including a duet with Ludacris and remixes of "A Milli". Lil Wayne performing at General Motors Place concert in Vancouver in January 2009. The lineup for New Orleans' 2008 Voodoo Experience concert, held in October, featured Lil Wayne. Jonathan Cohen of Billboard magazine reported that the event would mark his biggest hometown headlining set of his career. Lil Wayne stated that he would reunite with Hot Boys alongside Juvenile, Turk, and B.G. They plan to release an album after B.G. 's solo album Too Hood to Be Hollywood was completed. Wayne also performed as the 2008 Virgin Mobile Music Fest with Kanye West, performing the remix of "Lollipop" with West and also lip-syncing to Whitney Houston's "I Will Always Love You". Lil Wayne also performed at the 2008 MTV Video Music Awards with Kid Rock ("All Summer Long"), Leona Lewis ("DontGetIt (Misunderstood)") and T-Pain ("Got Money"). On the season premiere of Saturday Night Live, he performed "Lollipop" and "Got Money". He later performed at the homecoming rally at Vanderbilt University and the 2008 BET Hip Hop Awards with 12 nominations. He won the "MVP" title at the BET Hip Hop Awards and seven others. It was revealed that M.I.A. dropped out of performing on the tour due to her pregnancy, however Jay-Z is expected to perform with Wayne on the song "Mr. Carter" at select shows. On November 11, 2008, Wayne became the first hip-hop act to ever perform at the Country Music Association Awards. He played alongside Kid Rock for the song, "All Summer Long", in which Wayne did not rap but instead inaudibly strummed guitar strings alongside the guitarist in Kid Rock's band. Shortly after, Wayne was nominated for eight Grammys – the most for any artist nominated that year. Wayne was then named the first ever MTV Man of the Year at the end of 2008. He won the Grammy Award for Best Rap Solo Performance for "A Milli", Best Rap Performance by a Duo or Group for his appearance in T.I. 's single "Swagga Like Us", and Best Rap Song for "Lollipop". Tha Carter III won the award for Best Rap Album. MTV News listed Lil Wayne number two on their 2009 list of the Hottest MCs In The Game. On December 23, 2009, Wayne released a collaboration album with Young Money, with the first single confirmed as "Every Girl". The second single is "BedRock", featuring Lloyd. The third single is "Roger That". On May 24, 2010, the album was certified gold by the RIAA with over 500,000 copies sold. Wayne is featured on the song, "Revolver", with Madonna for her 2009 greatest hits album, Celebration. He was also featured on a Weezer song, "Can't Stop Partying", on their 2009 album, Raditude. In late 2008, Wayne stated that he would re-release The Carter III with leftover tracks and call it Rebirth, several months later, however, he announced Rebirth would instead release as his debut rock album, maintaining its title as Rebirth. To support the release of Rebirth and a collaboration album with Young Money Entertainment, Wayne headlined the 'Young Money Presents: America's Most Wanted Music Festival'... a United States and Canada–only concert tour which started on July 29, 2009. The Rebirth album was originally scheduled for a April 7, 2009 release, however after numerous delays, the album was released on February 2, 2010. For the anticipation of Rebirth, Wayne was featured on the cover of Rolling Stone. "Prom Queen", the first official single, debuted on January 27, 2009 immediately after a live Internet broadcast on Ustream of his concert in San Diego. "Prom Queen" peaked at number 15 on the Billboard Hot 100 charts. On December 3, 2009, Lil Wayne's second single from the album, "On Fire", was released on iTunes. "On Fire" was produced by Cool & Dre. "On Fire" peaked at number 33 on the Billboard Hot 100 charts. "Drop the World", which features Eminem, is the third single from the album. Lil Wayne was thought to be releasing an EP entitled I Am Not a Human Being, but it was confirmed that would be a full length LP. The album was released on September 27, 2010 which was his birthday. The album has sold over 953,000 copies in the U.S. and has spawned a successful single in "Right Above It" which peaked at No. 6 on the Billboard Hot 100. In an interview on MTV's Mixtape Monday, Wayne asserted the possibility of the album Tha Carter IV. Following Tha Carter III's achievement of selling over 3 million copies, becoming 2008's best-selling record, Wayne re-signed with Cash Money Records for a multi-album deal. Wayne said Tha Carter IV will be released in 2009 just before the holidays. Birdman had previously stated that Tha Carter IV would be packaged with Rebirth as a double disc album. However, Wayne denied this idea saying that "Tha Carter IV deserves Tha Carter IV". He went on to say that We Are Young Money may be packaged with Rebirth. However, it was later confirmed that Rebirth and We Are Young Money will be released separately and that Tha Carter IV will be released during 2011. He started from scratch on Tha Carter IV since getting released from prison. He recorded his first track since being released from prison and it was described as being "a 2010 version of A Milli on steroids." The album is set to feature multiple guests, including Tech N9ne. The first single "6 Foot 7 Foot" featuring Cory Gunz was released on December 15, 2010. It was available for digital download on iTunes December 16, 2010. The song is produced by Bangladesh, who also produced Lil Wayne's single "A Milli" in 2008. On March 8, 2011, Lil Wayne released another song called "We Back Soon." The song is produced by StreetRunner; It is more relaxed than "6 Foot 7 Foot" is, but will not be a track on Tha Carter IV. He also released a second single to Tha Carter IV called "John" on March 24, 2011, which features Rick Ross and is produced by Polow Da Don. On April 20, 2011, the official cover of Tha Carter IV was released. Tha Carter IV was scheduled to be released on May 16, 2011, but Mack Maine had confirmed that the forthcoming ninth studio album will be released in June 21, 2011 instead of May 16, 2011, because they need more time to make the album perfect and they'll have a "monster" single coming soon that will possibly be titled "Blows My Brains" or "She's Always In My Head". On May 26, the 3rd single, "How to Love" was released. Tha Carter IV was eventually pushed back to August 29, 2011. A song called "Dear Anne (Stan Part 2)" was released in June, when the snippet was released back in April. Lil Wayne said the song was throw away track for Tha Carter III. He said it was originally suppose to be on Tha Carter IV when it leaked, but decided not to put it one there. He said he's not a fan of the song since it was so old. Lil Wayne said that he that liked the beat, but not the lyrics, and was thinking about redoing "Dear Anne." For preparation for Tha Carter IV, Lil Wayne released a mixtape titled, Sorry 4 the Wait. He named the mixtape so as an apology to his fans for the delay of the album. It consists of 13 with all the beats on the mixtape coming from other artists song, like his "No Ceilings" mixtape. In July 2011, Lil Wayne confirmed in an interview with MTV that Tha Carter IV is finished. The album debuted at No. 1 on the Billboard 200 with 964,000 copies sold in its first week, making it Lil Wayne's third chart topping album of his career. On January 8, 2012, According to Nielsen SoundScan was elected the seventh artist (second male artist) all-time best-selling tracks digital with 36,788,000 million to the end of 2011. Lil Wayne has announced several possible upcoming projects, including a collaboration album entitled I Can't Feel My Face with rapper Juelz Santana that has been in production for several years. And also working on Tionne "T-Boz" Watkins' album Still Cool in late 2011. He has discussed a possible R&B album titled Luv Sawngz, for which he will heavily rely on a vocoder. He has also talked with singer Lloyd about doing a collaboration album in the future. On June 19, 2008, Lil Wayne and T-Pain formed a duo called T-Wayne and planned to release an album. According to an interview with Drake in the December 2011 issue of XXL, plans for an upcoming album with Lil Wayne have been scrapped for the time being because of the Jay-Z and Kanye West collaboration Watch the Throne. Lil Wayne and Baby will release a second Like Father, Like Son. It was announced by Mack Maine that Lil Wayne and Juelz Santana have gone back to working on their collaboration album I Can't Feel My Face which had been delayed for a few years due to "label politics". In October 2011 it was reported that Lil Wayne is working on sequels to I Am Not a Human Being and Rebirth. A couple months later, Birdman announced that I Am Not A Human Being II will be released before the summer of 2012 and that him and Lil Wayne have finished recording Like Father, Like Son 2. On March 29, 2011, in an interview with Hot 97's Angie Martinez, Lil Wayne announced that he would retire at age 35; saying "I have four kids," and that "I would feel selfish still going to the studio when it's such a vital point in their lives." Lil Wayne was a guest debater going up against Skip Bayless on the "1st & 10" segment on the January 6, 2009 edition of ESPN First Take. On February 10, 2009 he also appeared on ESPN's Around the Horn and beat out veterans Woody Paige, Jay Mariotti and fellow New Orleanian Michael Smith to win that show's episode. Prior to the 2009 Grammy Awards, Wayne was featured in an interview with Katie Couric. On February 7, 2009, he presented the Top Ten List on CBS's Late Show with David Letterman. He then appeared on the April 24, 2009 episode of The View, talking about his GED and addictions. In September 2009, Wayne was profiled in an episode of VH1's Behind the Music and was a presenter of the 2009 MTV Movie Awards. In film, Wayne produced and composed music for and starred in the direct-to-video film Hurricane Season. A documentary of Lil Wayne titled The Carter was released at the Sundance Film Festival. On February 19, 2008, Lil Wayne and Cortez Bryant revisited their alma mater McMain Secondary School to get students to design an invitation to the gala introducing Lil Wayne's nonprofit One Family Foundation. The website Change.org states: "The mission of One Family Foundation, Inc. is to empower urban youth by engaging them in opportunities to cultivate their talents and skills, educating them to become productive and economically self-sufficient, and motivating them to dream beyond their circumstances." 2010 Saturday Night Live Himself Performed alongside Eminem a medley of songs including "No Love"